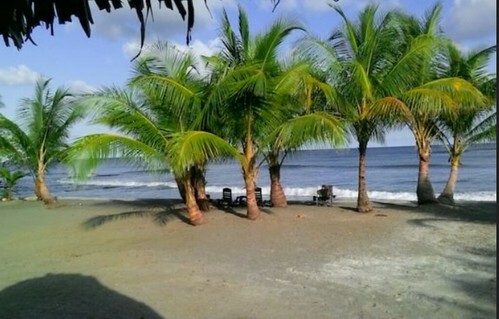 Here are two excellent real estate bargains in Panama. Here’s the view from a Panama beach front home for sale. Guess the price? It’s only $125,000 asking for this two bedroom, two bath, fully furnished ocean front house. This is a perfect property IF you like a bit of isolation as it sits on an amazing beach and has this wonderful view shown above. The house is fully furnished and seller financing is available. Or if you are a handy person… or good at getting craftspeople to work, this fixer upper is very special at its really low price. The asking price is only $55,000 for this 4 bedroom, 3 bath house on an extra large fenced lot with a lot of fruit trees. Only 5 minute drive to the beach the house needs about $10,000 in repairs will be worth $125,000 when completed. This is in a neighborhood which was the executive housing for Chiquita banana in Puerto Armuelles, the most affordable beach town. However, when you invest in real estate ANYWHERE, you need to take care. The process is always ruled by BUYER BEWARE! So here’s 10 valuable tips from our friend Jackie Lange who is a Panama real estate expert. I’ve been a real estate investor for more than 25 years and have bought and sold hundreds of properties so I know real estate. But in Panama the whole process of buying and selling are completely different. You should know that usually only a Panamanian is a licensed real estate agent or broker. Foreigners can sell real estate but are considered a “consultant” or associate. A foreigner cannot prepare any contracts or other paperwork for the purchase or sale of real estate. A foreigner cannot be a “real estate agent” or licensed until they have been working with a broker for several years then take a test, in Spanish, to get a license. 99% of the foreigners who sell real estate are not licensed real estate agents. Any foreigner who is working in Panama or selling real estate is required to have a work permit. If you’re working with an expat (foreigner) to buy or sell real estate, you should ask to see their work permit to verify that they are working legally. An owner can sell their own real estate without having a work permit… unless they have made a business out of buying and selling real estate then they need a work permit. If a foreigner is advertising that they have a “real estate agency” in Panama, it could be an illegal operation. Chances are they do not have a work permit either. It is better to work with a company and sales people are work legally in Panama and avoid those who are not working legally. Neither the Panamanians nor the foreigners who sells real estate or helps you buy real estate are obligated to a fiduciary responsibility in Panama. A fiduciary responsibility means that they will put your interest above their own. It’s not required in Panama though some honest real estate agents/consultants do put your interest first and foremost. Others will say and do anything to get the sale and their commission. Some agents, but certainly not all, will put their commission above your best interest. That’s why it is important to always have your OWN attorney do a title search and create the purchase contract. Your attorney can also give you advice about what is needed to successfully buy real estate in Panama. Unfortunately, many real estate sales people will not tell you that so there are ten Panama real estate rules you should always follow when looking at Panama real estate. To read the ten Panama real estate rules you need to know, click here. Over the past 50 years, Merri and I have invested in real estate in Hong Kong, London, Gloucestershire England, Isle of Man, Florida, Oregon, North Carolina, New York, Georgia, the Dominican Republic and Ecuador. We know. There are special bargains everywhere, if you learn how to look and how to protect yourself. Panama is an excellent country to find real estate bargains, but get to know the country and how the market works before you invest.